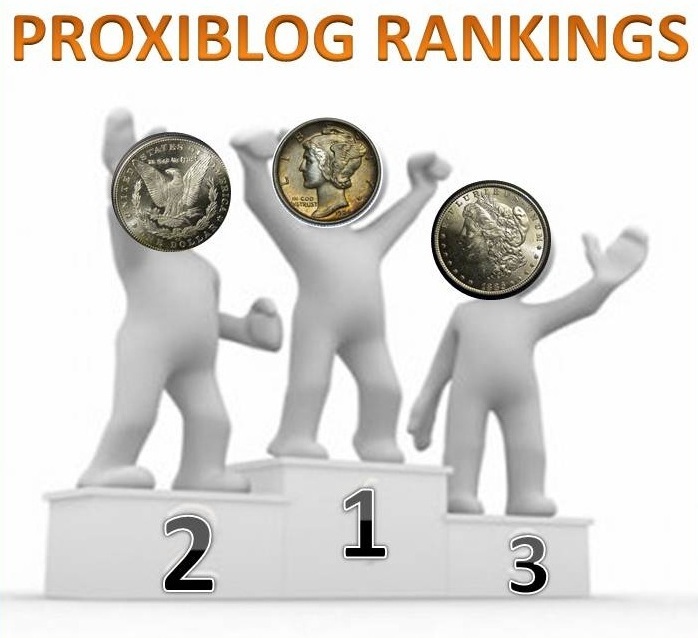 Proxiblog took a brief hiatus but now has returned with a new look, new rankings and new features to serve both auctioneers and bidders. We have redesigned our site to be more viewer-friendly with larger fonts and easy-on-the-eyes color. We hope you approve! Our rankings are becoming more consistent as our very top houses continue to offer ever choice consignments on a regular basis with reasonable premiums for buyers, quick shipping, excellent photography and other specialties, such as concise numismatic lot descriptions. You’ve seen almost every house in our top rankings for several months now, although ones at the very top continue to compete with each other based on where bidders are most likely to spend their numismatic dollars and not be disappointed when the shipment arrives at the front door. Weaver Signature Coin and Currency Auction was poised to be alone atop the rankings until Western Auction posted two alluring auctions in the same week with rare Morgans and other uncirculated scarce silver pieces. Winning in each auction was difficult. More than half of the lots in Weaver and Western auctions sold above retail. Leonard Auction charges a higher buyer’s premium at 20% with a cash discount; however, John Leonard’s numismatic knowledge and terrific consignments almost always assure bidders that they will not be disappointed in their winnings. The trick here is to take the buyer’s premium into account but bid high if you really want a lot because you’ll often win it for less than your maximum. We get to know auctioneers as friends and business clients. We know they are trying their best to keep standards high and have witnessed improvements across the portal. Sometimes, however, bidders forget that auctioneers do not make killings when they showcase coins on Proxibid. In addition to fees, consignment costs, shipping and more, even the best and most advertised sessions typically only bring $1500-$3000 or less to the auction company in profits. Hosting coin auctions is time-intensive, requires numismatic knowledge and photography skills unlike that of other collectibles auctions. But buying coins as a hobby or investment calls for ever higher standards, and we will do our part to educate both auctioneer and bidder on the finer points. One new feature planned this week is “Find the Flaw,” when we will depict a coin offered on Proxibid that has a flaw so subtle as to be missed. We will let you view the coin on one day and then reveal the flaw on the following day. We also will be spot-checking auctions for how they grade in their lot descriptions. We will post our first spot-check review this week on Southwest Bullion. We also will continue to do feature posts on standards and disseminate news and articles to help both bidder and auctioneer succeed in this very engaging but challenging field. Finally, we will try to post each week day as we continue to upgrade the site. Thank you bidders and auctioneers for your patience and patronage! We appreciate you more than you know (and that appreciation also extends to Proxibid). This entry was posted in Best Practices, Featured Updates and tagged American Numismatic Association, Auctioneers, AuctionZip, Best Practices, Coin Auction, coin photography, iCollector, John Leondard, Larry Fuller, Leonard Auction, Matthew Bullock Auctioneers, National Auctioneer Association, Proxibid, Proxiblog, Silvertowne Auction, Weaver Signature Coin Auction, Western Auction. Bookmark the permalink.